When suicidal hijackers crashed airliners into targets in New York City and Washington 10 years ago, killing almost 3,000 people, U.S. Senator Charles Hagel of Nebraska was in Florida with President George W. Bush. “This is the second Pearl Harbor,” Senator Hagel exclaimed when he heard the news. It’s an analogy that has been repeated many times since. 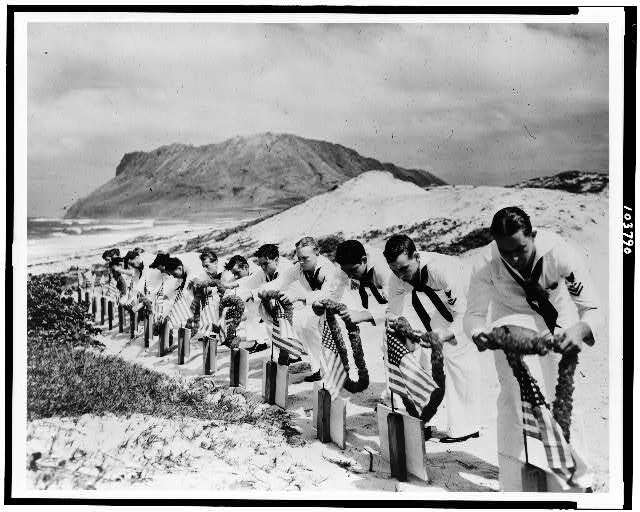 But does the sneak attack upon the U.S. Pacific Fleet in Hawaii that pulled the United States into World War II — an event whose 70th anniversary our nation will mark with solemn ceremonies on Wednesday — really equate with those terrorist assaults? But you can bet that we’ll see it through. And we will do it again. Similar expressions of resolve would follow the carefully orchestrated attacks on an unsuspecting nation 60 years later, in 2001, leading to inevitable comparisons with Pearl Harbor. Do these parallels stand up? In many ways, yes, Donald M. Goldstein, a public-policy historian (now emeritus professor) at the University of Pittsburgh, told me shortly after the September 11th terrorist attacks. Dr. Goldstein, a retired U.S. Air Force officer who has written four books on Pearl Harbor, said there were immediate indications that those stealth attacks would unite a nation. The Japanese assault 60 years earlier certainly had, he said, more than any other event. 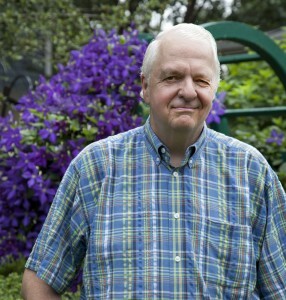 “Even in the American Revolution, one-third were against it, one-third were for it, and one-third fought it,” he told me. And Professor Goldstein found an unfortunate link between the 2001 terrorist attacks and the terror from the sky over the American naval installation on Oahu. No new intelligence agency would emerge, but there was plenty of second-guessing about our readiness for the terrorists’ onslaught. University of Florida historian Michael Gannon published a book about Pearl Harbor called A True Story About a Man and a Nation Under Attack. The man was Admiral Husband Kimmel, commander of the U.S. Pacific Fleet. He was vilified for the loss of more than 2,400 men and several battleships at Pearl Harbor. Professor Gannon predicted that an angry nation would again look for someone to blame for the breakdowns in intelligence that may have contributed to the astounding success of the Islamic terrorist missions. For example in the trial of the men who bombed the World Trade Center in 1993, it was developed that these men had a more extended plan than just bombing one of the towers of the trade center. 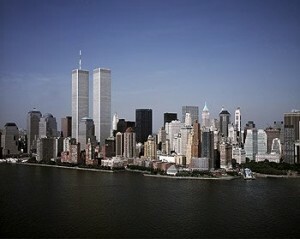 They had a plan that incorporated the flying of aircraft into those towers. And people just passed over that as, I guess, dreaming. Similarly, Senator Warren Rudman and others presented a report to the United States Congress in February of this year  in which they predicted that within a short amount of time there would be a major terrorist attack on some installation in the United States. Now were those warnings of sufficient clarity and force that we can blame somebody for not taking heed? I’m not sure. 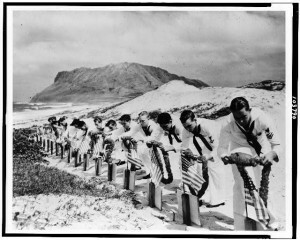 Michael Gannon pointed out that the sailors at Pearl Harbor were not really sleeping. Most ships were fully armed, with all hands on board. But because of the failure of Naval Operations to forward intercepted messages, the men were blissfully unaware of what was about to befall them. 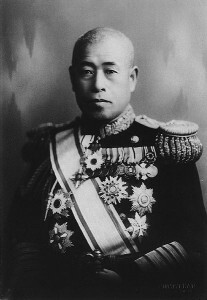 But Dr. Gannon added that the United States was surely not naïve about the threat that Japan posed. 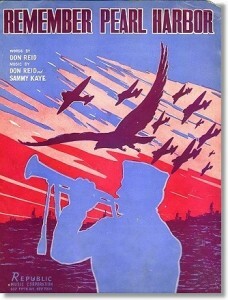 We had instituted the military draft in the United States. Our industries were gearing up for the manufacture of ships and tanks and aircraft. Munitions were pouring off the assembly lines. We knew that we were going to get into this war someday, somehow. So I think Yamamoto’s characterization of us as being a sleeping giant is not correct. He angered the American people. He surely did, because until December 7th, half of our population at least was isolationist, not desiring to become engaged in any war — European or Asian. And Yamamoto, by his unprecedented action in attacking us without warning, so aroused the American public that isolationists just went by the board [lost favor]. As investigators uncovered more and more links between the dead and captured 9/11 terrorists and radical Muslim Osama Bin Laden, Arab-American and religious leaders pleaded with the nation not to repeat scenes of hatred and suspicion that marked the treatment of Japanese-Americans in the days after the Pearl Harbor attack. 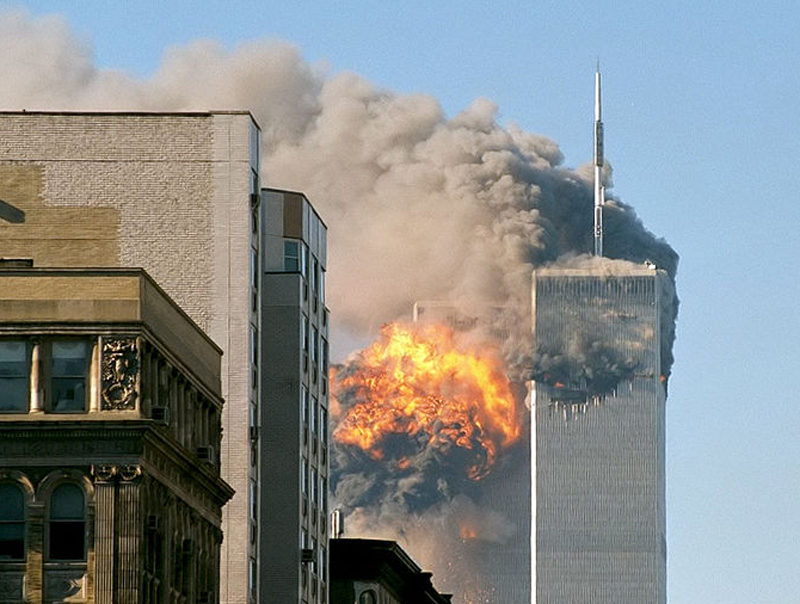 As for differences between December 7th, 1941 and September 11th, 2001, one for sure was the nature of the attacks. 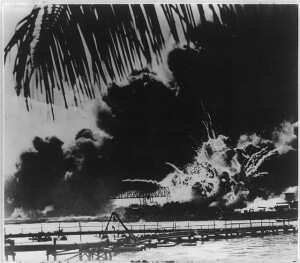 Military pilots bombed and strafed a military target at Pearl Harbor. Civilian hijackers rained terror on everyday office workers in New York, relatively defenseless civilian and military officials at the Pentagon outside Washington, and ordinary travelers and crew in the air over Pennsylvania. Following the attack on Hawaii, it was easy to define the Axis foe. The elusive enemy 60 years later proved trickier to identify, locate, and destroy. Looking back on both events, some observers point out that unlike the attack upon Pearl Harbor, which took place in far-off Hawaii, the 9/11 terrorist assaults struck directly at the heart of the nation’s business and military complexes. So a greater sense of unease and vulnerability pervaded the United States in 2001 than in 1941. Political analyst Stuart Rothenberg pointed to the considerable differences in styles between the men in charge of the nation in those two years. 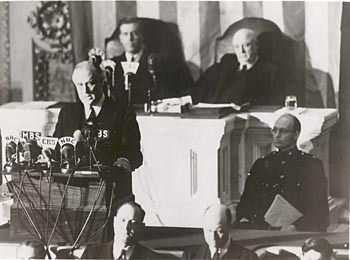 Franklin Roosevelt, he said, was an erudite writer and speaker. Plain-talking George Bush was a former businessman. Just as the attack on Pearl Harbor provoked righteous anger, not cowering fear, in every part of the United States. It put us into NATO. It gave us the bomb. It freed women [by putting them in the workplace]. It changed our ways. This [9/11] is going to do similar things. We’re not going to be going to the airport and just get on any more. They’re probably going to be checking us [for weapons] at the movies one day. Some of our freedoms are going to be given up. He was right about the heightened airport security. 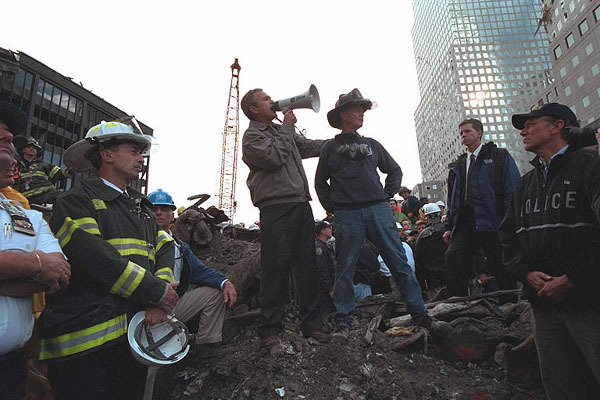 In the eyes of many observers, the terrorist rampage 10 years ago — or what President Bush called the “first war of the 21st Century” — robbed the world’s mightiest power of some of our smugness and feelings of invulnerability. But others pointed out, even then, that the attacks would also, in Pearl Harbor fashion, awaken and unleash a furious giant. Blissful. Extremely happy, quietly joyous, blithe. Landphair believes the liars in DC. 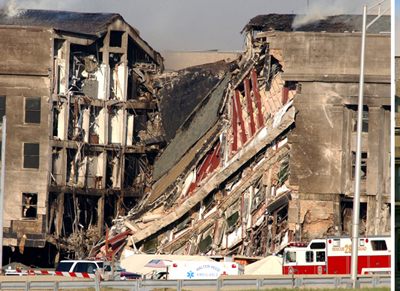 the buildings fell in 9-11 by obvious controlled demolition. There was no pit in PA and cells phones don’t work from altitude. The Pentagon was hit by a ground-launched missile; there was no major airplane debris. Plus many more reasons it was a fake attack arranged by the Bush Gang and Israel’s Mossad. Wake up Ted!! All a trigger to justify invasion of Afghan, Iraq, Libya, and Iran, (Syria?). Afghan is about a pipeline, and Iraq is about oil and defense of Israel. Iran is oil. Libya was oil and evicting the Chinese. The USA grand plan is to get all the oil and minerals in the mideast, and Africa and keep China OUT !! see my writings in part 8 in the margin of my site Forward-usa.org. Re Dave’s comment: To each his own! Positing a conspiracy theory for such widespread events would require a whole lot of evidence that counteracts what all of our eyes saw. Good luck with that! The germans and the japanese were not fooling around in their desire to control the world as the many accounts of those who encountered their brutality during ww2 will confirm . We had no choice save war in that regard. As far as 911 is concerned one might view it as an attack by the oil producing middle east , i say might? I still to this day do not know why Bush sent our people to iraq? The equivalent reaction by FDR would have been for him to order troops to Peru after Japan had attacked ? Still even if one views it as an attempt by the oil producers to control the world by default should we not have been employing Rosie the biodiesel production worker and any and every available american to work, volunteer what have you at making this country energy independent during the 7 years that remained of the bush admn after the attack ? No such measures emerged under mr bush’s leadership . China has grabbed the lions share of the oil infrastructure projects within iraq and the chinese are also in the process of constructing a railway connecting their , albeit small , natural border with afghanistan to haul away raw copper and lithium out of that country and no doubt turn it into innumerable gadgets and gizmos constructed by slave labor within that prison country to be purchased by our directionless mindless shopping majority? Isnt that what mr bush said just a day or two after the attack ? ” go shopping” ? What price this ?